Chicken is a naturally healthy choice for family lunches and dinners. Chicken is high in protein, and it is lower in cholesterol and saturated fat than red meat. The fact that chicken cooks quickly makes it an excellent choice for busy families. It's no wonder chicken outranks beef and pork consumption in the U.S. These recipes run the gamut, from whole roasted chickens and boneless chicken breasts to crunchy fried chicken and slow cooker favorites. Grand Marnier makes this chicken dish next-level. You can also use Cointreau or another type of orange liqueur, for a similarly delicious effect. Dried cranberries and green onions add color to these easy boneless chicken breasts. 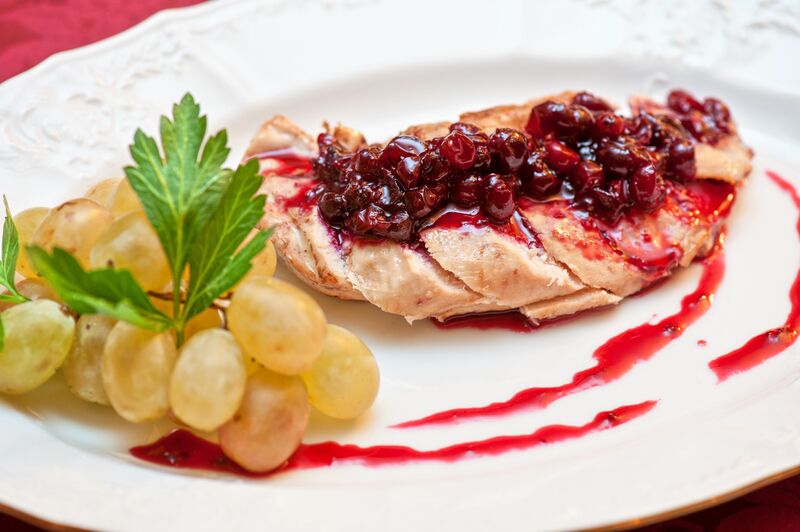 or simply serve the chicken with a garnish of cranberry sauce. Cream adds richness to this quick chicken Marsala recipe. The thickened sauce makes a tasty topping for the chicken and pasta or rice. A light breading of seasoned flour gives the thin chicken breasts a delicious coating in this skillet lemon chicken recipe. A simple lemon and wine sauce mixture adds just the right amount of flavor to the dish. If you think crispy fried chicken is a messy, labor-intensive task, think again! The skillet crisps the skin and then the chicken goes into the oven for a perfect finish. You might not think of making a dish with these two unrelated proteins, but chicken and shrimp go together remarkably well. Serve the delicious combo over hot cooked fettuccine or rice. Add these family-friendly buttermilk fried chicken tenders to your weekday menu rotation. Serve them with sweet and sour sauce, ranch dressing, or remoulade sauce for dipping. Creole seasoning adds the spicy flavor, but feel free to throw some cayenne in if you love heat. Fresh chopped cilantro, red bell pepper, grape tomatoes, and green onions get together to make up the flavor profile for these fast and easy boneless chicken breasts. Whether homemade or purchased, pesto is a fantastic ingredient for all kinds of dishes. A simple combination of pesto and heavy cream makes up the flavorful sauce for these lean sautéed chicken breasts. This roasted chicken dish, with its appealing blend of ingredients and flavors, is surprisingly easy to prepare and cook. This sauce for these chicken thighs tastes rich, but it's lighter than you might think. To make it even lighter, use boneless chicken breasts in the recipe. Chicken breasts cook quickly, so adjust the cooking time accordingly. Chicken chili makes a hearty meal with slices of crusty French bread or hot baked cornbread. This recipe utilizes chicken thighs because they offer more flavor and stay juicy even after long, slow cooking. Whether you choose to serve it over biscuits, toast, or rice, creamed chicken is an excellent choice for a satisfying family dinner. Balance the meal with a tossed green salad or a vibrant green steamed vegetable. The sophisticated flavors in this creamy bourbon chicken dish will wow your friends and family. They'll never guess the dish took less than 30 minutes to throw together and cook. Sweet paprika adds color and flavor to these baked chicken breasts. The reduced liquids and some sour cream make a rich, creamy gravy. Prep time is about 10 minutes; just pop the chicken in the oven and bake! The addition of chunks of potatoes, carrots, and celery make this roasted chicken a complete meal in one pan. If you're a fan of sheet pan dinners, this recipe is for you. Chicken marries nicely with all kinds of fruits, and this recipe for chicken with peaches is an excellent case in point. Orange juice, vinegar, and brown sugar add sweet-sour flavor to the sauce. This chicken is a snap to prepare and cook in a skillet. The sour cream makes for a rich finish, balancing the flavors of the diced cooked bacon, green onions, and garlic. These easy baked boneless chicken breasts are incredibly easy, and they come out of the oven moist and crusty. Even your pickiest eaters will ask for more. It's amazing how a few simple pantry ingredients can turn an everyday piece of chicken into a fabulous entrée. That's the case with this honey dijon-baked chicken. This four-ingredient chicken recipe takes less than 10 minutes to throw together. Just pop the chicken in the oven and enjoy the free time. Baked chicken drumsticks or chicken legs get a drizzle of honey and brown sugar sauce as soon as they come out of the oven. A coating of Parmesan cheese and panko crumbs ensures a crispy, crunchy crust on the oven-fried chicken thighs. Whole chicken legs are not only budget-friendly; they also offer loads of flavor. 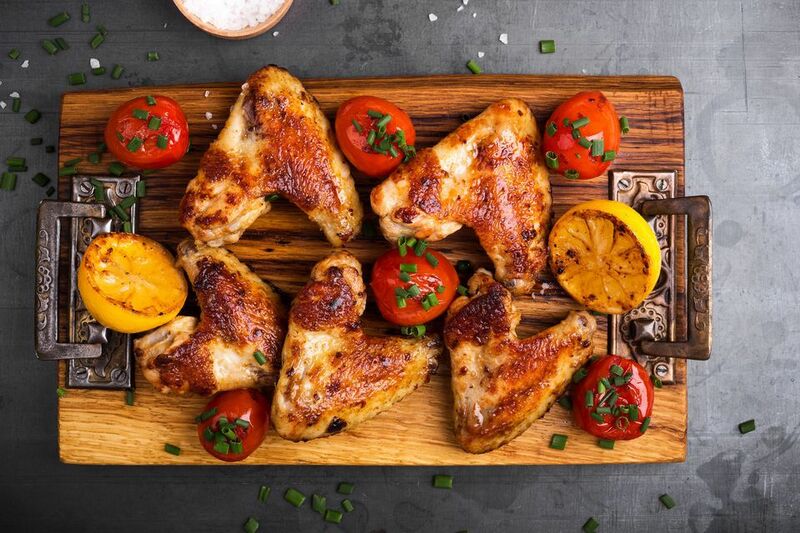 A ​combination of garlic, olive oil, and simple seasonings flavor these chicken legs perfectly. How can something so easy, taste so special? Simply sautéed chicken breasts are finished in the oven with spaghetti sauce and lots of melty mozzarella cheese. A Boursin cheese filling keeps these baked stuffed chicken breasts moist and tender while a Parmesan cheese and breadcrumb coating provides the crispy coating. All you need is 10 minutes and a slow cooker to make this easy crock pot Italian chicken dish. Just add a salad or steamed veggies for a satisfying everyday dinner. You probably have all of the ingredients for this chicken chowder on hand. It's the perfect blending of flavors, and condensed soups make preparation a breeze. Baked biscuits provide the base for this slow-cooked chicken and biscuits dish. Use frozen, canned, or homemade biscuits for the recipe. The straightforward combination of chicken breasts, condensed soup, and broccoli, makes this chicken recipe perfect for a busy day. Dry salad dressing mix and cream cheese add zesty Italian flavor and creaminess to these crock pot chicken breasts. Spicy andouille sausage pairs nicely with boneless chicken thighs and a Cajun-style tomato sauce mixture. Serve it over rice for a taste of Louisiana. A creamy Creole-style sauce highlights the chicken in this crockpot dish. The "holy trinity" of Cajun and Creole cooking, onions, bell pepper, and celery, adds flavor and texture to the dish. This comforting casserole will make your day. Just layer the stuffing mixture, chicken, and sauce in the slow cooker and press a button. What could be easier? Get your trusty seasoned black iron skillet out for this moist and juicy chicken. This whole roasted chicken is easy enough for an everyday meal and special enough for Sunday dinner. You only need four ingredients to make this fabulous chicken dish: chicken thighs, a packet of dry ranch-style dressing, a clove of garlic, and olive oil. The chicken bakes to golden perfection in about 30 minutes. Just one taste will convince you to add this ritzy casserole to your monthly mealtime rotation. It's an excellent potluck dish as well. Fried chicken is probably the first dish one thinks of when asked to name some iconic Southern dishes. Dig out your skillet and fry some chicken! Pepper jelly and some Dijon mustard make up the easy coating for these chicken thighs. The chicken is rolled in finely crushed stuffing crumbs and baked to perfection. Cook this versatile family-pleasing chicken stew in the oven or slow cooker. A cut-up chicken or chicken thighs are the main protein, so not only is the stew delicious; it's easy on the budget. Boneless chicken breasts team up with mushrooms and a flavorful tomato dish in this French-inspired dish. The original dish was created in the year 1800 to celebrate Napoleon's Battle of Marengo victory. Because the preparation is just so easy, you'll be surprised at the depth of flavor this chicken recipe offers. Lemon, garlic, and capers are among the ingredients in this delightful dish. This rustic chicken dish is a family-pleasing combination of chicken leg quarters, tomatoes, and mushrooms. Serve the chicken with roasted or mashed potatoes or noodles.